Milo had his one year well baby checkup yesterday. He gained in length and head circumference but lost in weight. The doctor was concerned and we are now going to see a eating therapist to get him evaluated and since he's not say Mama and is saying Dada to everything rather than assigning it meaning we are going to get evaluated by the speech therapist. We also decided to go ahead and give him all of his shots on time as well. I was on the fence about it and Chris was uncomfortable with not giving him all of his shots. Since there is no one with Autism on either side of our family and since there's been a measles outbreak recently we came to the conclusion that he was not at high risk for the MMR causing Autism and we wanted him to be protected against measles. Going ahead with his vaccinations on time was the right decision for us. He had a mild fever this morning but, praise God, other than that he has had no reactions to the shots so far! Also he has all of his one year molars coming in right now. He hasn't let me look in his mouth but the Dr. said his gums were very swollen and red. He never seems to get one tooth at a time. The first time he got two teeth at once and the next time he got six! Milo's poor little goopy eye. Of course P&PT's are coming your way! I know first hand what that feels like... to pass your baby off to someone so he can undergo surgery. You will be on my mind all day Thursday! My prayers are always with you my dear, and will be especially for the surgery. I'm glad you've gone ahead with the shots--a sound decision. You all will definitely be in my thoughts and prayers! I hope Milo has a very speedy recovery, too! I am glad you went ahead with his shots. You have my prayers for Thursday...for Milo and for you. Also, praying you find out why he is not gaining weight. I know EXACTLY what you are going through with the eye. I can tell you anything you want to know ;) My daughter (who is now 5) had a blocked tear duct and we were facing the same thing. It just cleared up when she turned one. Exactly one! Then I have a little boy who turned one this year on July 11. 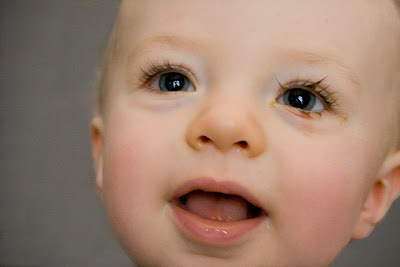 He had a small mass appear on his eye at about two months of age. It continued to grow and we continued to pray. He was so little we didn't want to put him under anesthesia, that too was my bigger fear. We kept going to the ped. opthamologist until I felt like it was time. They went into to remove the mass... and it ended up being a lot bigger than the Doc had anticipated. He is an awesome ped. opthamologist, which is good because I don't think there are that many here in San Antonio. It was a little traumatic afterwords... coming out of anestesia is rough on the little ones. There will prob. be a lot of crying, and you can't console them. You will probably cry too :)The doctors kept telling me it is not a big deal, it's in an out. Well, when they escorted me back to see him after surgery (remember he is only seven months old at this point) I was almost angry at the lack of preperation. After about an hour though, he was calmed down... and so I was too. Yes, it is a minor surgery to the doctor, but anytime they touch my baby it is a big deal to me ;) My prayers are with you... and I know first hand... All will be fine. I'll be glad to talk to you about anything! Just shoot your questions to me!